Holding signs and balloons, some 400+ people waited in anticipation for presidential candidate Congressman Dr. Ron Paul to arrive for a rally February 2, 2012 at the Elko Indian Colony Gym at 4:30 p.m.
Paul noted a reason “the Revolution was fought and the Constitution was written: to give us sound money. Only gold and silver is supposed to be currency. It is not to be paper. As a matter of fact there is a prohibition in the Constitution that says you cannot remit bills of credit: you can’t print money and give bills of credit. That means only gold and silver can be legal tender. It’s still on the books. But in Washington, have you ever noticed, on occasion they just ignore the Constitution?” Laughter and applause came from the audience. Paul said, “To add insult to injury who got the bail-outs? They said, ‘Well, this is a real mess we got into and we’ve got to save us from a depression.’ So they said, ‘We’ve got to bail out the banks and the big corporations’; and it is true: they were on the verge of a depression; but they should have had the depression; you shouldn’t have gotten the depression.” Again there was applause. Paul pointed out the 4th Amendment ensured “they couldn’t come into our houses; couldn’t look at our papers and send the military after us; and they had to have proper search warrant; but today they don’t” since 9/11. Paul related, “The President said there’s a lot of bad people. We have to make everybody safe” and that “there are Americans who are very dangerous and we have trouble catching them and trying them” as a justification for a new policy meaning “an American citizen can be assassinated without charges and without a conviction.” Noting the President signed the NDAA [National Defense Authorization Act] New Year’s Day, Paul said to the crowd, “Happy New Year. It said that the President can instruct the military to arrest any American citizen without any charges” and that citizens “can be denied an attorney and held indefinitely even in a foreign prison.” The crowd booed. Paul turned his attention to the “baseline budgeting deal in Washington” which plans “to increase the budget at a steady rate over the next 10 years.” Paul joked, “The Soviets only had 5 year plans; we have 10 year plans for the budget” at “about ten trillion dollars over the next years, automatic increases.” Paul noted Congress turned “to this Super Committee, who’s made a super mess of everything, and they couldn’t come up with anything and so the automatic cuts came up” which say “we will cut a trillion dollars over these proposed increases. Well, you know that’s one hundred billion dollars a year. That used to be big money but that’s not big money anymore. So, guess what? Our national debt goes up a hundred million dollars every month” and “that’s why I want to cut a trillion dollars out of the budget in one year.” Again, there was applause. 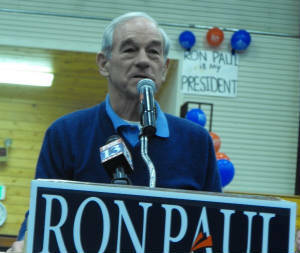 Paul said, “We need to be ready for the change and the change means we want our liberty back; we want the rule of law back; we want a strong national defense and we want to have everybody to mind their own business.” With that Paul concluded and took questions as chants of ‘President Paul’ resounded. Asked about gold mining taxes, Paul said, “The federal government has already gotten way too much” and Paul reiterated his opposition to income tax. Paul noted wryly that “the Department of the Interior owns the land instead of the people of Nevada owning the land,” to applause. Paul added, “Students are graduating from college” and “because of the system and this debt-financing, the students owe more money than all the credit cards: a trillion dollars. And this is the consequence of the monetary policy and the way government entices people.” Paul said, “There is no authority for the federal government to be involved in any form of education,” rather he called for public education to “be a state function. Believe me if you had the government gone the cost of education would be a lot less and you would be able to get a job.” Again, there was applause.